With a cast including Aamir Khan, Amitabh Bachchan, Katrina Kaif and Fatima Sana Shaikh, the film has been speculated to be the biggest opener of this year. The much-awaited Yash Raj Films period drama Thugs of Hindostan received mostly unenthusiastic response from critics on its opening day. With a cast including Aamir Khan, Amitabh Bachchan, Katrina Kaif and Fatima Sana Shaikh, the film has been speculated to be the biggest opener of this year. The never-before-seen combo of Aamir Khan and Amitabh Bachchan, with the support of Yash Raj Films, is expected to help the film do well on the box office. Industry expert Taran Adarsh posted on Twitter: "All that glitters is NOT gold... Holds true for #TOH... Some engrossing moments in the first hour, that's about it... Formula-ridden plot, screenplay of convenience, shoddy direction are the main culprits..."
He however mentioned in a further tweet that Thugs of Hindostan may benefit from the holiday season, the hype it has managed to create and impressive star cast, but will find it difficult to sustain its journey on the box office after the initial euphoria settles down. In his earlier opinions, Adarsh had mentioned that Thugs of Hindostan could earn as much as Rs 50 crore on its opening day. Thugs of Hindostan has been written and directed by Vijay Krishna Acharya, who was also at the helm of Dhoom 3, and has been produced by Aditya Chopra. The film was completed with an estimated budget of Rs 300 crore. Citing the cost of the film as a reason, Yash Raj Films has instructed film exhibitors to increase the price Thugs of Hindostan tickets ten per cent higher than that of Rajkumar Hirani's Sanju (in multiplexes) and Remo D'Souza's Race 3 (in single screen theatres). As per earlier reports, the Thugs of Hindostan tickets are likely to be priced from around Rs 400 to Rs 1,500 in the premium multiplexes, whereas the single screen theatres may see the average price go up to Rs 200. 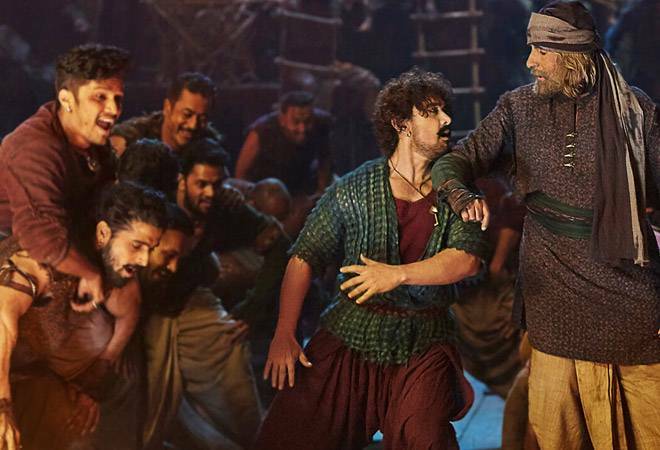 Thugs of Hindostan Box Office Collection: Is Aamir Khan-Amitabh Bachchan's movie off to a better start than Dangal?